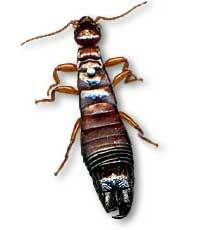 Earwigs have been a pest for many years in the United States. There are over ten species in America, but four are most common and likely to invade homes. These include the European, the Shore, the Ring Legged and the Seaside Earwig. Some of these have wings, some have stripes on their abdomens, some are dark brown, but all have pinchers. Earwigs are both plant and insect eaters. In fact, they will eat just about anything. Plant damage looks much like slug damage; the main difference is that slugs will leave a slimy trail behind where earwigs leave no foot prints. Plant damage can be extreme. Although it is most common to find small irregular holes, earwigs will readily eat all of the "meat" of a leaf leaving only a skeleton frame behind. Earwigs also like insects. Though they may feed as predatory insects, earwigs will readily eat dead insects, algae and vegetation.